"All work and no play makes Jack a dull boy" -- or, rather, a homicidal boy in Stanley Kubrick's eerie 1980 adaptation of Stephen King's horror novel. 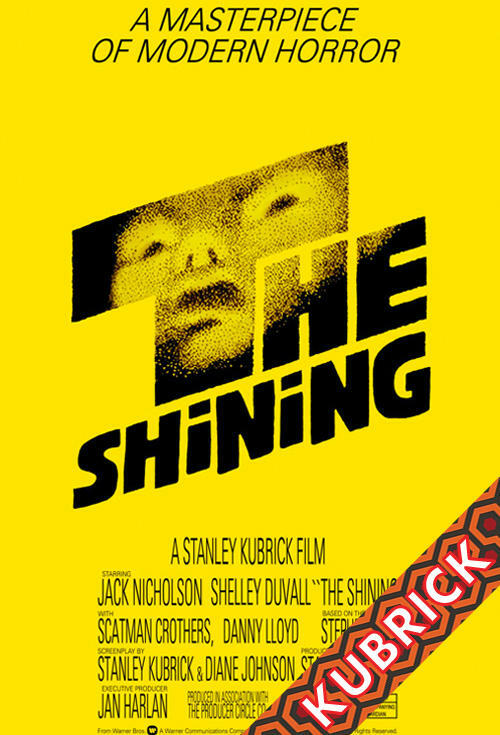 With wife Wendy (Shelley Duvall) and psychic son Danny (Danny Lloyd) in tow, frustrated writer Jack Torrance (Jack Nicholson) takes a job as the winter caretaker at the opulently ominous, mountain-locked Overlook Hotel so that he can write in peace. Before the Overlook is vacated for the Torrances, the manager (Barry Nelson) informs Jack that a previous caretaker went crazy and slaughtered his family; Jack thinks it's no problem, but Danny's "shining" hints otherwise. Settling into their routine, Danny cruises through the empty corridors on his Big Wheel and plays in the topiary maze with Wendy, while Jack sets up shop in a cavernous lounge with strict orders not to be disturbed. Danny's alter ego, "Tony," however, starts warning of "redrum" as Danny is plagued by more blood-soaked visions of the past, and a blocked Jack starts visiting the hotel bar for a few visions of his own. Frightened by her husband's behavior and Danny's visit to the forbidding Room 237, Wendy soon discovers what Jack has really been doing in his study all day, and what the hotel has done to Jack.